Florida is known as a popular tourist destination because of its sunny beaches and family-friendly theme parks. But tourism isn’t the only thing it has going for it. Floridians enjoy a high quality of life due to the affordability, pleasant weather, and varied activities that are available. Brevard County is located just east of Orlando along the Space Coast. If you’re interested in investment property, Brevard County is a great location for a few key reasons. Brevard County is in close proximity to Orlando and all its family fun making it a great place to raise a family. Equally appealing are the fantastic beaches that are enjoyed nearly year-round. The convenience of this location translates to more jobs, more people renting, and an overall higher quality of life for residents. Brevard County offers activities for families that allow for a fun day out while staying close to home. The Brevard Zoo, riverboat tours, parks and the Foosnar Art museum are all great places to explore. Whether visiting or renting long-term the culture of Brevard County is varied and full. Thanks to the Kennedy Space Center and the nearby Cape Canaveral air force base, the two locations where NASA launches manned spaceflights, Brevard County is quickly becoming a center for cutting-edge science and technology that rivals even Silicon Valley in California. Many young people with science and engineering degrees move to Brevard County for work, making it a great area to rent out property. 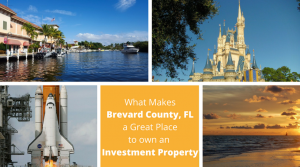 These are just a few of the things that make Brevard County a great choice for your real estate investment property. Any time you invest in property it pays to have the experts on your side, and at All Brevard Property Management, we will take the work out of owning a rental property. You can contact us anytime to learn more about our property management services and how we can help you with your investment property.